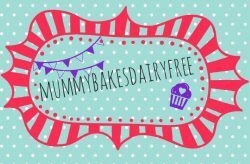 After my mummybakesdairyfree does the Great British Bake Off challenge I said I wanted to make more desserts and puddings. Most of my recipes on here are dinners which whilst being tasty sometimes a sweet treat is needed. This recipe uses one of the new allergy friendly lines on sale at Tesco- Oatly custard. My review of the custard will be online soon but until then here is a recipe featuring it! Banoffee Pie, Banoffee Cake, Banoffee Trifle whatever the final product, the combination of bananas, caramel/toffee and cream is delicious. Not the most allergy friendly or healthy dessert but I can change that. 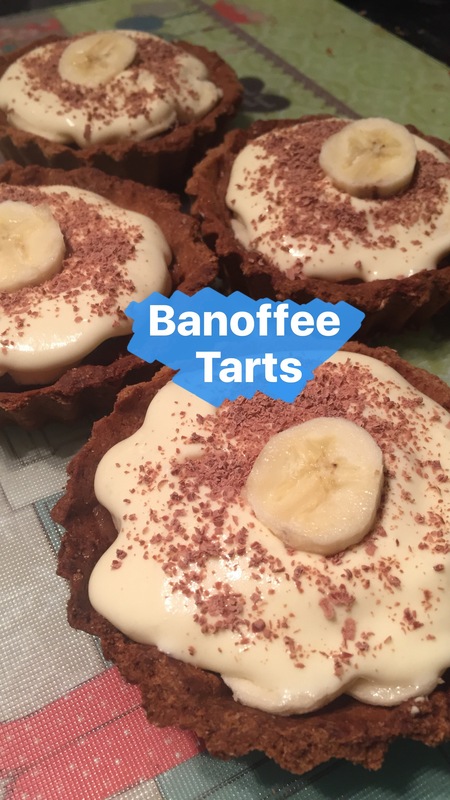 My Banoffee Tarts are dairy, egg, nut and soya free. They’re also vegan and healthy, well healthier!! The caramel/toffee is sweetened by fruit and coconut sugar is used to sweeten the pastry. There is refined sugar in the custard and grated chocolate but everything in moderation, right?! There are a few steps to this recipe but I’ve tried to simplify it as much as possible. 1. Sift together the flour and sugar, into a large bowl. Add the DF spread and rub together with your fingers until there are no more large lumps. Start to bring the pastry together with your hands, adding a tbsp of cold water if it’s too dry. Keep working the dough until a ball is formed. Wrap in cling film and place in the fridge to chill for 15 minutes. 2. Whilst the pastry is chilling, preheat the oven to 200c. Grease four small tart tins with DF spread and cut out four circles of making paper. They should be larger than the tart tins. 3. Remove the dough from the fridge and divide into four equal portions. Rollout each portion into a circle less than 5mm thick, on a lightly dusted board. Carefully transfer each pastry circle onto the tins. Press the pastry into the tin, making sure there are no splits. Prick the bases of the pastry with a fork. 4. Then line each pastry case with the baking paper and fill with baking beans or uncooked rice. Make sure the beans are tightly packed in. Pop the tins onto a baking tray and place in the oven. Blind bake for 30 minutes. After 30 minutes take the cases out of the oven and remove the baking beans and baking paper. Return the cases to the oven for 10 more minutes. 5. Once cooked, take the pastry cases out of the oven and allow to cool slightly before trimming off the excess pastry. Remove the pastry cases from the tins and allow to cool fully. 6. Whilst the pastry tins are cooling you can make the toppings. Check out how to make the caramel date sauce here. 7. Pour the custard into a large bowl and use an electric whisk to beat it until light and fluffy (about 5 minutes). You’re then ready to assemble! 8. Spooon a tbsp of the caramel date sauce into each of the tart shells, spreading it out evenly. Layer the banana slices on top of the caramel. Then spoon a couple of tbsps of the custard onto each of the tarts. Finally sprinkle with a little grated chocolate and finish with a banana slice. Enjoy!!! I absolutely love banoffee pie and I have to say those little banoffee tarts looks right up my street! Caramel date sauce… what are you like, you naughty lady! Must check it now! #Thanks for joining in with #FreeFromFridays.